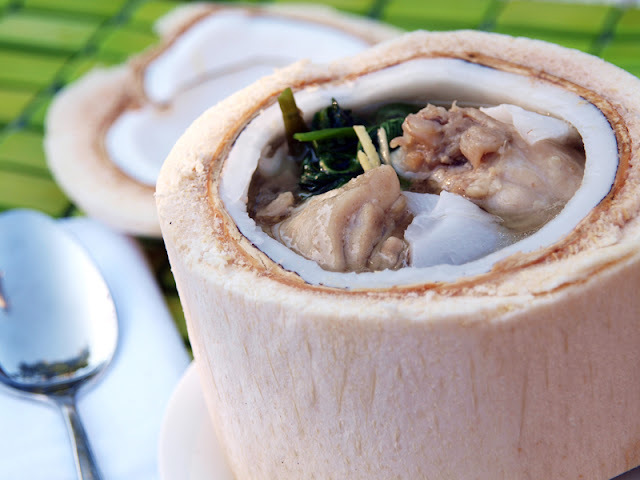 A favorite of former US President Bill Clinton when he came to Manila, this dish originates from the southern provinces of the Philippines where coconut production is done on a large scale. 1 Heat the oil in a saucepan and stir-fry the garlic until golden brown. Add the onion and ginger, and stir-fry until the onion is translucent. Add the lemongrass, salt and pepper, and stir-fry for another 5 minutes. 2 Add the chicken and stir-fry until lightly browned. Then add the stock and bring to a boil. Reduce the heat and simmer for 45 minutes until the chicken is tender. 3 Add the coconut meat and reserved coconut juice, and simmer for another 5 minutes. Season with salt and pepper if required. Serve hot, garnished with fresh coriander leaves.